In the U.S. we talk about balance a lot, but what do we really do to achieve it? We are a nation built on hard work and the idea of working harder to yield greater reward. Even the balancing activities we turn to, like yoga, are often viewed through the lens of how much will I sweat? In Europe, balance is the way of life. Longer vacation periods, more definitive rest periods at the end of the day, not taking your job home with you. All contribute to a balanced lifestyle. For example, I rarely get an email from a European client or colleague “after hours” even though they are just as connected as the rest of us. What products stood out? Ones that helped achieve inner balance, mind, body and spirit. Hello my lovely alkaline earth metal, where have you been all my life? 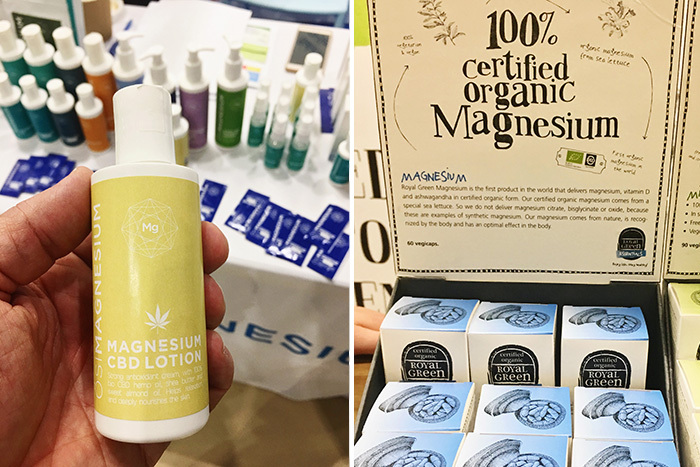 Magnesium burned bright at this show as a stand-out nutrient of the year. An anti-inflammatory, it also helps calm stressed nerves, yet delivers an energy boost and can aid digestion. For as many benefits, there were just as many ways to consume it – from topicals to pills to magnesium-infused water. We received a sample bottle (500ml) and just as we were about to walk away, the samplers gave us a warning – “don’t drink it all at once” – just 100ml at a time, otherwise you risk some real action in your digestive system. Noted and we followed their suggestion. Charles observed the flavor was like drinking an Alka-Seltzer. 100ml at a time is definitely enough. Good news! Magnesium is in many food products, from whole grains (say hello again to “good carbs”) to spinach to peanuts. Some media attention on the magic properties of magnesium and it may become one of those sub-nutrients that consumers know they need, but can’t get into too much detail about why. It’s not the next macro-nutrient like protein, it’s more like vitamin D.
Saw this at Expo West and it isn’t necessarily new, but there were some new ways of delivering it rather than just bottled water. The UK has recently focused its attention on the environmental challenges created by the billions of plastic bottles their country generates each year. 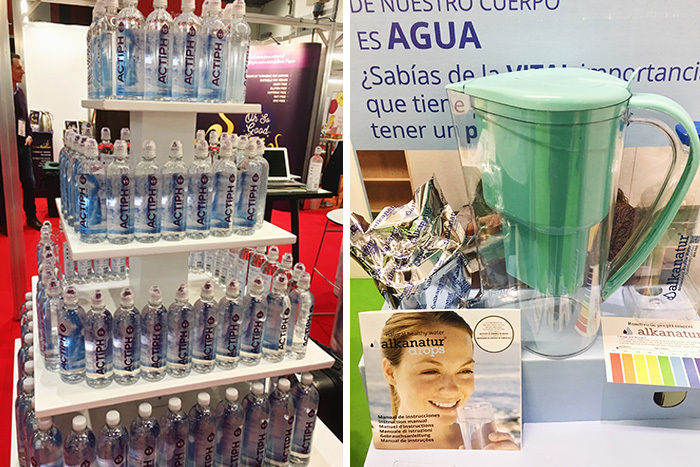 At the show, we came across two water filter with pitcher systems that filter out impurities and create an alkaline water in return. Why is this important? Our diets are largely acidic, and that throws off the pH of our bodies. Consuming alkaline foods and water is supposed to help restore the balance of your blood’s pH. When your blood is balanced, oxygen is more readily available – which means you have more energy (!!!) Ironically, as this article points out, it’s our protein-rich, processed food diet that is tipping us to the acid side of the pH scale. Alkaline water may not be in your business plan but some pretty common fruits and vegetables could find their way in. Strawberries? Raisins? Spinach? Kale? Those and many more alkaline foods could be incorporated into your next “balance” bar. Just make sure you use an alkaline nut like hazelnuts and skip the peanuts which are really acidic. That’s right, we’ve finally made it to the body’s energy centers known as the Chakras. There are seven located from your perineum to the crown of your head, including the heart and the throat. We found two products aimed at helping your chakras – a line of tea and a tincture that you add to water and drink. Both claim to be specially designed to help clear any blocks in the designated energy center, bringing you balance. I sampled a delicious tea designed for my throat chakra. A small sample probably wasn’t enough to make a difference, but I know from some personal energy work which of my chakras I’m more and less connected to, so I’d be game for products that I enjoyed that might help in that endeavor. Unless you have a chakra-educated audience, you have a better chance at success developing products and communicating a benefit of ‘inner-balance’ derived from these formulations. Think of it as the 21st century version of the “balanced breakfast” we used to see promoted in TV spots. At Expo West, people were concerned that they were going to get a “head high” from this hemp and marijuana plant extract. 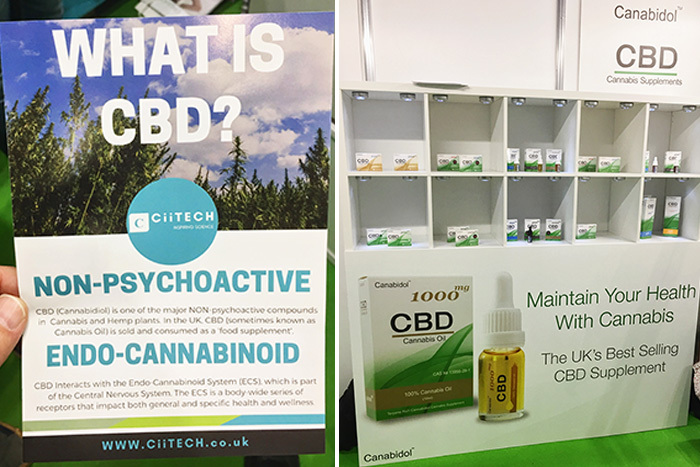 CBD is not psycho-active like THC (found in marijuana), but it is claimed to be good for a range of ailments that all connect back to your Endocannabinoid System, which are neural receptors throughout your body, being out of balance. That impacts everything from chronic pain, childhood epilepsy, depression, inflammation, heart health and skin conditions among others. CBD was available in supplements and liquids. Several of the manufacturers promoted that they imported it from Colorado. We were told that marijuana had been decriminalized in the UK, meaning you wouldn’t go to jail for carrying small amounts. That resulted in a lot of ‘no big deal’ reactions to CBD and more engaged conversation about the offering. Of course not all CBDs are made equal, depending on the purity of the strain of the plant and the processing method. Getting into CBD products might be worthwhile in the long run, or if your business is isolated to a state where understanding of marijuana and medical benefits is greater, but you will need to work to understand it beyond your circle of friends and colleagues, talk to the retailers, distributors and consumers. You may find you have a lot of educating to do. The next antioxidant superstars are here, in the form of certain mushrooms, roots, and herbs. Known as ‘adaptogens’, these edibles minimize different oxidizing effects in the body, reducing levels of cortisol (contributes to stress. Ashwagandha is also known as Indian ginseng and is a root. Shiitake, reishi, maitake, and cordycep mushrooms all have adatogenic, anti-tumor and immune-enhancing properties in them. Again, it’s about achieving some balance and in the case of adaptogens, offsetting damage done from our stressful lives. Mushrooms are already showing up in products in the U.S., there are plenty more opportunities to incorporate these and other adaptogenic ingredients into your product line. 1. Mindful Bites – We saw a few brands at Expo West promote their enlightened well-being but this brand is espousing mindfulness in all that they do – ethical sourcing, clean ingredient decks, delicious taste and innovative packaging (pouches with the straw inside!) and products – crispy sticks filled with nut buttery goodness. Like a mindful Twix. 2. Beetroot – In the States we’d just say “beets” but here it’s Beetroot and it’s being used in smoothies and to make yummy lattes. Beetroots are packed with vitamins and minerals (including magnesium) and the bulb itself is a great source of fiber. Just be careful not to stain your clothes. 5. New Forms – Thinner sticks of deodorants, water in cans for more environmental friendliness, and new design options (mouthwash tablets and toothpaste sticks) – Europe is always an inspiring destination for new ways of delivering familiar products. And I’m sure you’re curious if we saw any of the following…. Jackfruit – Yes! Several products including familiar brands from the States, definitely a growing product area. Water – Yes, mostly alkaline and pH infused, not nearly as micro-occasion focused as Expo West. Collagen – Some, but again, not as much in actual food – here’s a place for Europeans to develop to align to the US. Beauty Shots – Yes. There were shots a plenty, including some specially formulated beauty shots to help with wrinkle reduction, promoting cell regeneration and reducing bloating. These elixirs were served up in little vials. I was waiting for Isabella Rossellini to deliver a warning after I tried them. That, in a rather large, magnesium enhanced, internally balanced nutshell, was the Natural and Organic Products show. Will magnesium catch on? Can alkaline benefits gain traction in your country? We’d love to hear your thoughts. Hungry for other recent show write ups? Check out our Expo West recap, the 2018 Winter Fancy Food, and last fall’s Expo East summation. And all the good ideas in the world are worthless if you don’t have a culture of innovation in place to bring the ideas to life.